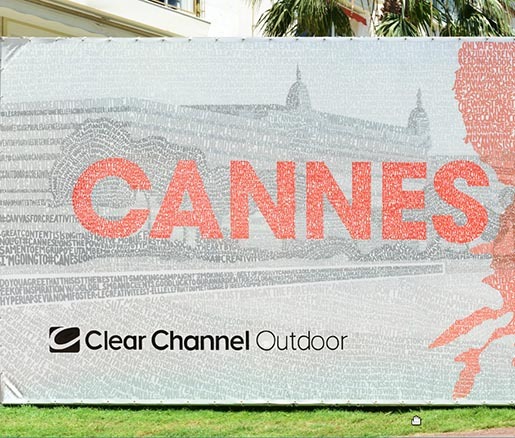 Clear Channel Outdoor (CCO) has celebrated its fourth year as a sponsor of the Cannes Lions International Festival of Creativity by completing a hand-painted micrography billboard made entirely of tweets and creating the world’s first gigapixel image searchable by tweet. 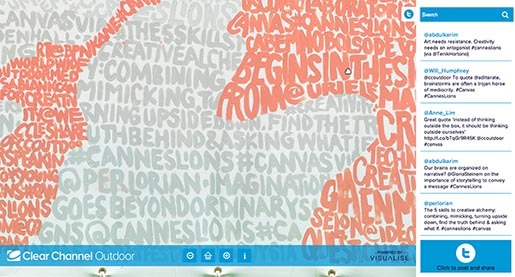 The billboard showcases a mural composed of hundreds of tweets around the idea of ‘realising creative potential’, generated by the company’s highly successful #canvas for creativity social media debate – the third most used hashtag at this year’s Cannes Lions. Billboard muralists, Tait Roelofs and Patrick McGregor, painstakingly hand-painted the best comments, perspectives, observations and quotes from the conversation onto the 16m x 4m canvas. In the making-of video the artists are seen in time-lapse, painting the canvas with the industry’s response to Clear Channel Outdoor’s challenge: how can it realise its full creative potential, against the backdrop of a global, real-time and increasingly digitally-connected world. 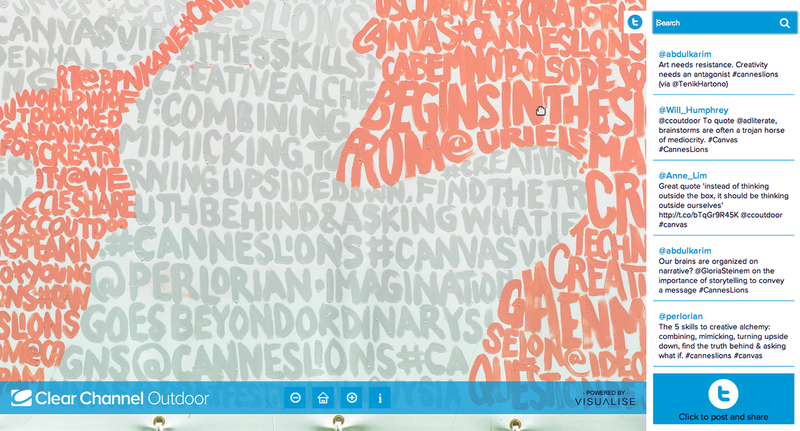 The mural, set in the grounds of Le Grand Hotel in Cannes, features the 60th Anniversary Cannes logo, celebrating the creative potential of the global advertising industry, and Cannes’ 60 years of recognising and inspiring exceptional creativity. To bring the debate to life beyond Cannes, the mural also provides the canvas for the world’s first gigapixel image searchable by tweet. Contributors can search for their tweet by keyword or Twitter handle, to see exactly where it was painted, in incredible high resolution detail. Search the mural here. The first debate topic, ‘Who owns the creative agenda?’, trended number 2 worldwide on Twitter. 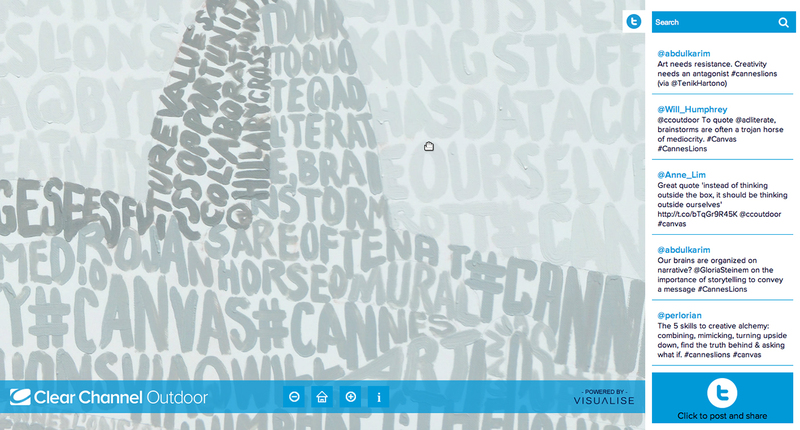 #canvas became the third most popular hashtag used at Cannes Lions. 1,217 tweets were contributed using #canvas or @CCOutdoor, delivering a total campaign reach of 15.7 million impressions on Twitter over the four-day period. The most popular debate topics were ‘can creativity be a bigger force for social good?’, generating the most opinions, while ‘is creativity an art or science?’, and ‘is technology redefining creativity?’ drove the most comments and conversations. Social media visualisations of the #canvas Twitter content were streamed on CCO’s website (clearchannelinternational.com/cannes), digital screens at the festival, and a high-resolution projection on to a separate 18m x 5m canvas located on the roof of the Le Grand Hotel, Cannes. The projection canvas was built specifically for the festival and sat at the highest spot on the Croisette – a spot never before used for advertising or media at Cannes Lions. This content played for a total of 18 hours every day to over 11,000 delegates from 92 countries. The Canvas for Creativity was developed by Clear Channel Outdoor’s international in-house marketing team, working with a roster of agency partners, including Buzz Radar (data visualisation), CURB Media (outdoor mural, high-resolution projection), Visualise (gigapixel image, 360⁰ images), Fishburn Hedges (PR), Proud Creative (design) and We Are Social (social media management). The artists are Patrick McGregor and Tait Roelofs, as part of CURB’s team. Social media debate leaders included Jason Beckley, VP of Innovation @ fusion92, Thomas Crampton, Veteran, award-winning journalist and digital media specialist for Social @ Ogilvy, Mark Cridge, Director of Consulting at BERG, Theo Delaney, commercial filmmaker and writer at Hotspur and Argyle, Will Humphrey, M&C Saatchi / LIDA as a Senior Strategist, Laura Jordan Bambach – Vice President of Design & Art Direction, Rich Leigh – Account Director of 10 Yetis PR Agency and blogger, Angela Natividad, strategist and co-founder of AdVerve, Will Pyne – Co-Founder & Exec. Creative Director for an engagement advertising agency, Holler (UK), Amelia Torode – Head of Innovation and Venture Strategy for an engagement advertising agency, Holler (UK), and Faris Yakob – Award-winning strategist and Creative Director.